A wood wax finish is an excellent way to seal and protect your favorite wood products, and it can provide a shine and sheen that certain paint finishes lack. Real Milk Paint Company sells only natural and environmentally friendly wood wax products, and there’s a great selection to choose from, including zero VOC wax, carnauba wax and wax flakes, Myland’s wax, soapstone sealer, and traditional brown wax. 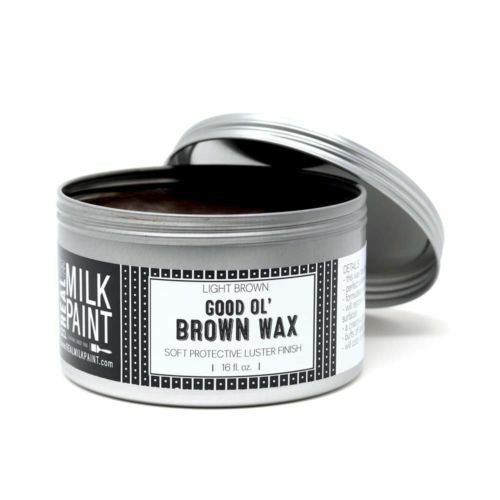 This green and eco-conscious wax is made from a blend of walnut oil, beeswax, and carnauba wax. It creates a permanent wax finish, meaning it won’t melt or be wiped away by cleaning products. The finish it creates brings depth and contrast to milk paint and other finishes, and the wax is extremely easy to apply. Carnauba wax is a natural product that comes from the leaves of the Brazilian Carnauba palm. It’s the hardest natural wax available, making it an ideal protective wax for wood products. The color of the wax varies from pale yellow to green-brown, and the finish it creates is known for its durability, luster, and resilience. Carnauba wax is a great finish for furniture because it has a high-sheen without being sticky or tacky. It can be applied with a rag to any painted surface, and it won’t melt in the heat of the sun, making it a great wood finishing wax for outdoor patio and deck surfaces, as well as other large areas. This protective finish is made from walnut oil and carnauba wax and is perfect for wood, soapstone, slate, and concrete. It can even be used for kitchen items, and the non-fading and low-luster finish means you don’t have to constantly re-apply the way you do with mineral oil. Another fantastic carnauba wax product, brown wax, can protect and restore the sheen to wood surfaces. The creamy consistency means it’s easy to apply, and it easily penetrates and covers nicks and scratches. As a finish over top of milk paint, it creates a soft luster, a tinge of color, and a light glaze effect. The Real Milk Paint Company specializes not only in milk paint but also in waxes that provide high-quality and protective finishes, and our natural products are safe for your body, the air, and the environment. Whether you want to refinish an older wood product or give some shine to a new paint job, these wood waxes can give you the perfect finish.